She specialises in the field of Obstetrics, Gynecology, Surgery, and Infertility with a focus on diagnosis of infertile couples, spermocytogram, hysterosalpingogram (tubes patency), treatment of infertility and intra uterin insemination. She is highly skilled in Obstetrics and can ably manage pre-conception care and pregnancy diagnosis, routine ante-natal screening program, normal and high risk pregnancies, foetal ultrasound scanning, stem cell collection, instrumental delivery (forceps, vacuum), caesarian section as well as all types of obstetrics emergencies. Her Gynaecological specialties include birth control, menopause, menstrual disorders, cervical screening: pap smear, HPV research, colposcopy, biopsy, infections, STDs, ovarian cyst, polycystic ovaries, endometriosis, breast cancer depistage and repeated pregnancy loss. 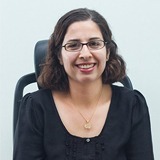 She has extensive experience in surgical cases with expertise in dilatation and curettage for missed miscarriage, diagnostic laparoscopy, removal of ovarian masses and cysts, ectopic pregnancy, hysteroscopy as well as vaginal surgery and vaginal hysterectomy. Dr. Saoussen takes keen interest in interacting with her patients and is fluent in French, English and Arabic.